The actor Iwai Hanshirô VII held the name of Iwai Komurasaki I from 1804 to the 10th lunar month of 1806. The actor Iwai Matsunosuke II held the name of Iwai Komurasaki II from unknown times to the 12th lunar month of 1835. Born in 1851. Disciple of Iwai Hanshirô VIII, he received the name of Iwai Komurasaki III. He was active in Tôkyô from 1876 to the beginning of the 1890s. 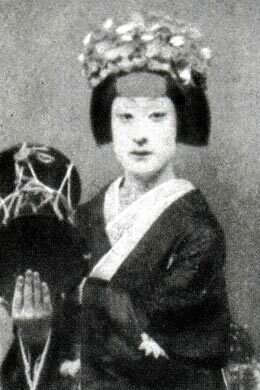 This lady-killer had a few tumultuous and scandalous love affairs, which have forced him to retire from the Kabuki world. He died in May 1920. Iwai Komurasaki III playing the role of Shizuka Gozen in the drama "Yoshitsune Senbon Zakura"